For Three Men The Civil War Wasn't Hell. It Was Practice! By far the most ambitious, unflinchingly graphic and stylistically influential western ever made, The Good, The Bad and The Ugly is a classic actioner shot through with a volatile mix of myth and realism, Screen legend Clint Eastwood returns as "The Man with NO Name", this time teaming with two gunslingers to pursue a cache of $200,00 and letting no one, not even warring factions in a civil war, stand in their way. From sundrenched panoramas to bold hard close-ups, exceptional camerawork captures the beauty and cruelty of the barren landscape and the hardened characters who stride unwaveringly through it. 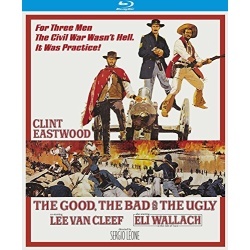 This 50th Anniversary Special Edition includes the 4k restored versions of both the 162-minute original theatrical cut and the 179-minute extended cut. 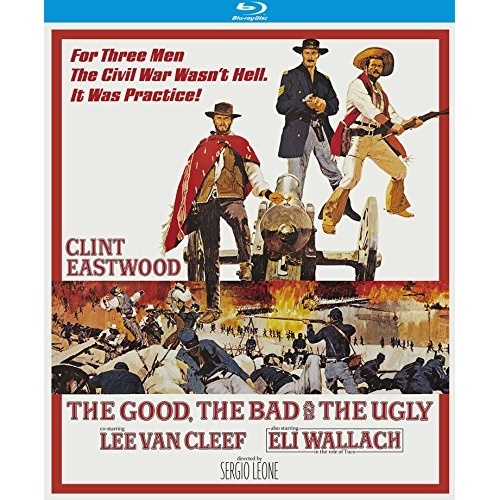 Hailed as "pure cinema" by Robert Rodrigues and :the best directed movie of all time: by Quentin Tarantino, this epic masterpiece was directed by the great Sergio Leone (For a Few Dollars More) and co-starred Lee Van Cleef (Death Rides a Horse) as Angel Eyes and Eli Wallach (The Magnificent Seven) in the role of Tuco. Music by legendary composer Ennino Morricane (A Fistful of Dollars, Navajo Joe).